In this episode: A mother writes that she and her husband are frustrated that they can’t share a peaceful meal with their toddler. They’ve tried a number of different set-ups, but their son ends up throwing tantrums and food. “I don’t enjoy meals,” this mom says, and she’s looking for a new approach. Hi. 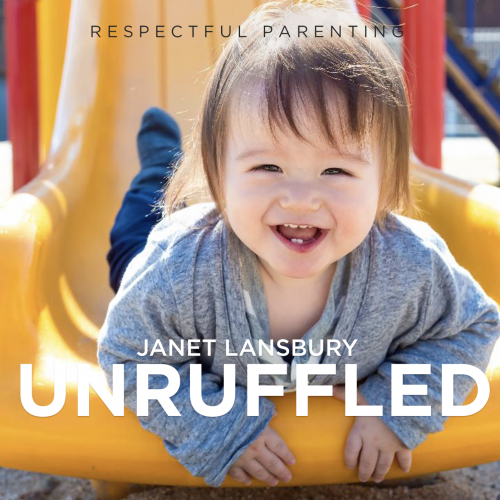 This is Janet Lansbury, and welcome to Unruffled. Today, I’m responding to an email I received from a mom who says that she and her husband are experiencing a lot of stress and frustration around their 23-month-old at meal times. They’ve tried a number of different strategies to get him to sit peacefully and eat, but everything they’ve tried so far eventually seems to end up in him having tantrums, or throwing food all over their dining room. It’s not working out. “Hi, Janet. We’re having some trouble during meal times with our 23-month-old. I’m aware of the advantages of a chair he can get in and out of himself, and have read your articles as well as Magda Gerber’s on the advantages of such a setup. However, this method seems to have created its own problems. At six months, we started our son off in a regular booster high chair, strapped in. Around 15 months, he started throwing tantrums constantly around meal time, including throwing food, et cetera. Then, he went through a phase where he wouldn’t go into the booster at all, and would only eat on my husband’s lap. This was not feasible for several reasons, but if he didn’t get to sit in my husband’s lap, he would scream interminably, and we’d all be late to work in the morning. After reading Gerber’s and your thoughts on the subject, we transitioned him to a toddler table about four months ago, and it helped stopped the tantrums and food throwing. He definitely seems to enjoy meal time more, however, meal time is still quite stressful for us. He gets up all the time and walks around with food, spilling it everywhere, and eating all over the place. He gets up and walks around with his fork, which makes us nervous. We have to constantly remind him to sit down, or else be all done. It’s stressful for my husband and me, because we’re constantly hounding him to sit, and constantly cleaning up food all over the dining room. I don’t enjoy the meals. In addition, we’re not sitting with him. Either my husband or I have to perch uncomfortably in the tiny toddler chair to eat with him, which we sometimes do, or else we’re sitting at the adult table nearby, but then he’s eating alone. He doesn’t seem to mind that setup, but I find it hard to model eating behavior, impossible to eat family-style, and it just feels like we’re isolating him. Okay, so I’m hearing some misconceptions here about Magda Gerber’s approach. Also, there’s an underlying issue that I’m sensing here. That is whose responsibility eating food is. If we take that on as our responsibility for our child, rather than trusting him to know what his body needs in terms of the amounts that he’s eating and what he chooses of the healthy choices that we offer, the selection that we offer him, then, in a sense, our child has us over a barrel in that that’s our priority, because we feel it’s our responsibility to get our child to eat, and to get them to eat enough. That will create a lot of problems, because it puts this sense of urgency and stress around eating for both of us, for us and for our child. It takes our child out of being in tune with his tummy, and his needs. It’s an important and kind of delicate message, but it’s between our child and his tummy. It’s really none of our business. If we make it our business, we’re going to create stress and problems for ourselves and for our child. Keeping that in mind, our job is to set up the way that we want eating to go in terms of the rules that we want to have around this experience. Again, none of those rules can be about how much he chooses to eat, or if he even chooses to eat at that meal time, but they can and need to be around the behavior that we’ll accept in the way that he’s handling food. The approach that I believe in, Magda Gerber’s approach, is actually quite strict in this area. It’s not strict with sternness and seriousness and unkindness, but it’s very strict in terms of the boundaries being very, very clear, and us really needing to be consistent and stick to them. And this wonderful rule that I believe is so helpful for so many reasons: sitting while they eat. 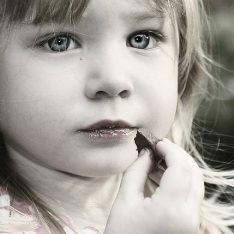 Children need, I believe, to have the limit that they have to sit while they’re eating. That can be, if you’re in the park, you’re sitting in the grass, you’re sitting on a bench, you’re sitting somewhere to have water, to have snacks, to have meals, for everything. What this does is it encourages children to listen to their tummies and make this a focused time, so that they’re not doing this while they’re doing other things, they’re not multitasking, and therefore not really tuning in to their biological needs. It’s also safer in that children aren’t running around with food. And it gives children a sense of manners around food so that they’re not putting food all over the house, they’re not going to a friend’s house and walking around with their food and dropping it everywhere. I’ve discovered children really do love this kind of care that we give them when we’re strict about them focusing on their meal, focusing on food when it’s served, and it not just being this halfway thing that they do. It’s special, and it’s a time to give our undivided attention. The reason that children resist being strapped into high chairs a lot of the time is that parents tend to put the baby in the high chair, and now they’re going off and they’re getting the food, and the baby’s stuck there longer than the baby wants to be. A baby can handle that while he or she is actually hungry and eating without attention from us, with the calm, peaceful sense of focus around it, but when they feel that, as maybe in this family’s case, “We’re putting you in here, and now we really want you to eat.” There’s that agenda, there’s that feeling coming from us that we have this expectation of them to eat the food, and the pressure around that, children will resist. They also resist when they’re stuck and we’re not really paying full attention to them. These are some of the reasons that Magda Gerber said, “Young children are ready to eat, but they’re not ready to dine,” meaning they’re not ready to sit and linger at the table and have coffee and hang out. They can be there to eat, and when they’re done, they want to move on. That’s developmentally appropriate for them. Later on, they’ll be able to sit politely for a bit longer while other people are finishing, but in these early years, Magda believed, and I have experienced this to be true, children should have this sense of autonomy that they get to decide when they’re done, and that they shouldn’t have to sit and wait for everybody else. That’s when you’ll see throwing food and other kinds of acting out behavior. Magda Gerber did also advise a different way that I practiced with my children, and to great success. It really worked for us. That is that once a child is able to sit independently, meaning, getting into a sitting position all on their own, then they can start being ready to eat at a small table. In the beginning, we used, and a lot of people use a bed and breakfast tray that has legs, so that’s a very small, short table. We sit across the table from them, and we sit on the floor. We have the food on the table, and our child comes crawling over, or maybe we bring the child over in the beginning, and say, “Okay, now I’m going to offer you some food. Are you interested in this food?” At that point, the child will either sit and have some of the food, or not. Then, again, in that interaction, we can anticipate, we can see our child is starting to move away, and we say, “Oh, looks like you’re starting to move away.” Maybe we put our hand on them gently, and we ask, “Are you saying that you’re done?” Then, right there, we will get this very clear, wonderful answer. This is mostly for us more than our child. It’s more for us to feel sure and to feel confident in our limits, which is so important with any kind of limits that we set. We have to be confident. We have to be certain that we’re doing the right thing, or at least more certain than doubtful. If the child goes away and we start to pick up the food and the child comes back, this is holding a limit. We have to say, “Oh, wow. You came back. Looks like you’re asking for more food. You changed your mind. You left and you came back. We’ll have food again later, but I’m not going to give you more now, because you showed me you were done.” These exact words certainly don’t matter, just something very comfortable, very confident, but not, “Well, I told you.” Not like that kind of thing. Upbeat, but at the same time firm. That’s how children learn. This parent’s description is a misunderstanding of what the autonomy involved in the child size table is about, because it’s certainly not about getting up with food, and moving around. I would never let that happen. If that is happening, then the child is struggling. They’re very distracted. They’re not able to sit and focus on their food, because they’ve got all these distractions of what’s allowed here?, and, Now I’m going to do this. Now I’m going to do that. Right there, we’re giving our child that choice. They can get up and leave and not eat more food, or they can stay and follow the boundaries around eating. These are very reasonable, age-appropriate boundaries. They’ll turn away, and then they’re just fine. They go back off to play. They’re just asking. They’re just testing to see if these boundaries are real and if they can depend on them. I strongly believe that children really want to be able to depend on them. They want them to be real. If they’re not consistent, then they’re not there at all. Then, the child has to keep testing and testing. Another thing that children test is playing with the food, so if we’re paying attention, we can actually see, we can sense when our child is done with that part where they’re hungry, and they’re really eating, they’re enjoying the food, and then it slows down, and now they’re playing with the food. We can stop that right away and say, “It looks like you’re playing with the food. I think you’re done eating.” Again, right there, we will get a clear answer if our child immediately goes back into, “Now I’m seriously eating here,” or if they continue in that testing behavior where we feel, “Oh, I’m getting played with here.” If we feel that, it’s almost always true. We should never feel guilty or bad about stopping something that we sense is gone over a line from honest hunger to testing. Then, she said he gets up and walks around with his fork. Okay, I wouldn’t let him do that either. Fork stays at the table. The food stays at the table. It all stays at the table, but then he can get up any time. Then, the food’s going to go away for a while until the next meal time. She says, “We have to constantly remind him to sit down or else be all done.” You don’t need to remind children, especially not a 23-month-old. They really do know. If you’re consistent about these boundaries, they don’t need to be told to sit back down. They’re very smart, much smarter than we give them credit for, generally. “Stressful for my husband and me.” Yes, I can imagine, “because we’re constantly hounding him to sit.” Should never have to happen. “I’m constantly cleaning up food all over the dining room.” Doesn’t need to happen. “I don’t enjoy the meals.” Right. That’s important. These are times for connection. These are anchoring times in our day with our child where we should give our full attention, and really connect for however long it goes on. It could be very brief, or a bit longer, but it’s the quality of the connection that matters. It’s 100% we don’t have our phones, we don’t have distractions, and it has to be enjoyable for both of us. If we’re not enjoying it, it’s probably because we’re afraid to set boundaries, because either we’re too invested in our child eating more than our child seems to want to eat, or we don’t believe our child is capable of understanding rules. Neither of those are true. Another reason this family isn’t enjoying the meals is because they’re not sitting with him. They’re perched uncomfortably in a tiny toddler chair, or they’re sitting at the adult table nearby. Neither of those are a workable solution. I actually looked up on the internet “low slung chairs,” and I found a lot of chairs, starting from a $20 camping chair. So get a chair. Get a comfortable chair. You don’t have to keep it out. If it’s ugly, you can put it away and bring it out just for meal times. If you do leave it out, this is just for a short phase in your family’s life, so get a low slung chair. I had one that was a vintage patio chair with rattan, but it had a cushioned seat. It was very, very comfortable, very low. 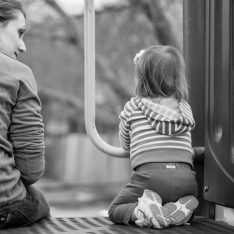 I wasn’t as low as my child in her chair, but I was low enough that I could sit with her. This isn’t at the bed and breakfast tray table, when I was sitting on the floor. This is when she graduated to being able to sit in a small, child size chair, and had a bigger table that my husband actually made, but there are a lot of ways that you can do this. You can buy a table like this family did, or you can cut off the legs of a table, an old table. These tables are wonderful, because children end up using them for art projects and block building, and all kinds of things. It’s a very good investment. This is important. It’s important that we’re comfortable so that we can savor these times together. That’s what our child needs. Our child needs clear boundaries and rules, and also for us to be there, present, and not try to rush it through and get it over with, and stressed. Really comfortable and able to be there. If we do this in these early years, it doesn’t even have to be all the time. We can still have a high chair around. This is what we did. We had a hand-me-down high chair around that we would use if we had a family gathering or something, we would have our child sit there. It was special, but again, our child already had these rules instilled about sitting when they eat, not getting up with food, and not getting up until they were done. You can do both. If you want to do some family meals, you definitely can, and you can still give your child the autonomy and the respect of having their child-sized time where they can have their feet on the floor and be truly comfortable. We can be comfortable with them, and enjoy the moment. Once again, number one, let go of your agenda around him eating. He’s going to eat enough. He’s going to eat the perfect amount for him if you can trust him. I understand that it’s scary, but it’s really important that children get to own this message that they receive from their bodies, and that we don’t add all this stress and agenda around that. Then, rules about how eating goes in your family. That’s up to us. Children are very capable of learning these from a young age if we’re consistent, if we’re kind, if we do it with love. Also, please check out some of my other podcasts on my website, janetlansbury.com. I also have lots of articles about meal time, and both of my books, they’re available on audio at audible.com: No Bad Kids, Toddler Discipline Without Shame. There’s a lot about boundaries there and how to teach them. Elevating Child Care, A Guide To Respectful Parenting is my other book. You can get them in paperback at Amazon, and an ebook at Amazon, Barnes & Noble, and apple.com. I also have an audio series called Sessions. 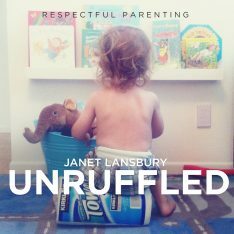 These are individual recordings of my private consultations with parents where we discuss a lot of details that I’m not able to go into here on my podcasts, and these are available by going to my website, janetlansbury.com and clicking the button that says Sessions on the top toolbar. You can order the episodes individually and read the descriptions about each one, or you can get them all, about three hours of audio for just under $20.